← Peanut Tofu Rice Bowl with Carrots & Broccoli. Peel and grate or mince the ginger; transfer to a small bowl. While the skillet heats up, drain and large dice the tofu (cut into ¾-inch cubes); place the cubes on paper towels or a clean towel and pat dry. Once the skillet is hot, add coconut oil and swirl to coat the bottom, then add the ginger and cook until fragrant, 15 to 30 seconds. Add the tofu to the skillet and season with salt and pepper; cook, stirring occasionally, until golden brown, 8 to 10 minutes. Once done, remove skillet from the heat. Cut the broccoli head into small, bite-sized florets and thinly slice the thicker stem portions; transfer to a medium bowl. Peel the carrots, then trim off the ends; discard the peels and trimmings. Using a box grater, coarsely grate the carrots. Transfer to a medium bowl. Once the tofu has been transferred, add the broccoli to the skillet and cook until slightly softened, 2 to 3 minutes. Trim off and discard the root end of the garlic; peel and mince or press the garlic. Transfer to a small bowl (that will be used to make the dressing). Juice the lime and add to the garlic. Add peanut butter, soy sauce, water, honey, and crushed red pepper to the garlic, and lime juice; whisk together until well combined. 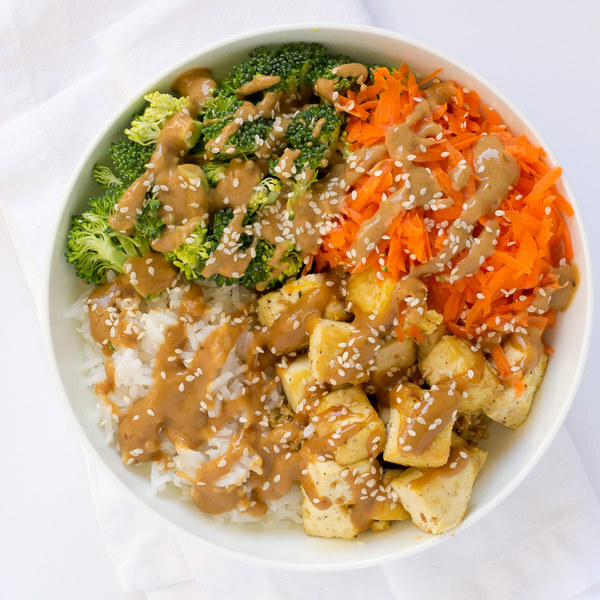 To serve, arrange rice, tofu, broccoli, and carrots in a bowl, then drizzle with the peanut sauce, and sprinkle with the sesame seeds. Enjoy!